For nearly 20 years the Washington Redskins searched for a franchise quarterback who could lead them back to glory, they found it in 2012. 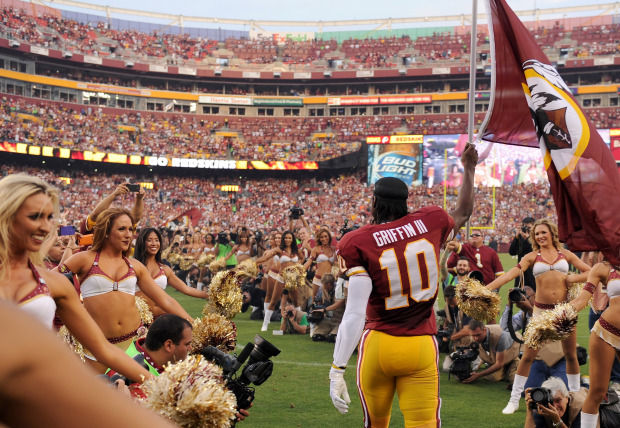 Griffin ushered in a new era of football in DC. The speedy RG3 gave coach Mike Shanahan and assistant coach Kyle Shanahan the dynamics to unleash an offense that defenses in the NFL had no clue how to defend. Griffin completed 258 passes while attempting 393, for a 65.6 completion percentage, 3,200 passing yards, 20 touchdowns and five interceptions.Robert’s passing rating was third best in the NFL at 102.4, and he broke the NFL rushing record for a rookie quarterback with 815 yards and seven touchdowns while only playing 15 games for the Redskins. Robert Griffin III has the distinction of leading the league in yards per play passing (8.14 yards per play) and rushing (6.8 yards per carry) in the 2012 season. The future is unknown for Griffin at the moment after suffering ACL and LCL tears in his right knee during the playoffs this year, but he is determined to make a comeback and be better than ever before in 2013. His recovery time is projected to be 6-8 months, which would be just in time for the 2013 season. It would not be completely fair to say that Alfred Morris is the “second” best, it was more like RG3 was 1A and Morris is 1B. While Griffin did, in fact, change the way teams view the Redskins, Alfred Morris was the work-horse back that fueled the Redskins run. Teams were utterly shocked as week after week they set their game-plan up to stop Griffin and then Alfred would tear them up. 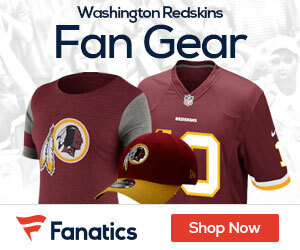 Morris rushed 335 times for 1,613 yards (Redskins franchise record) and 13 touchdowns in 2012. Alfred rushed for over 100+ yards on seven different occasions, including 200 yards against the rival Cowboys in the last game of the season. The 24-year old Morris finished second in the NFL in rushing to only Adrian Peterson, who finished 9 yards shy of the NFL record. Many questions loomed over Trent Williams heading into the 2012 season. Williams was suspended from the Redskins for the final four games of the 2011 campaign for failing a drug screen. Williams came out on a mission and with the intention to make up for his past wrongdoings. Trent has risen to being one of the top left tackles in all of football in the last few months and is the main line of protection for RG3 and the high octane Redskins offense. Going forward the 24-year old will look to be the leader of the offensive line for years to come as he is already a team captain. The Washington Redskins had a collection of stats that will make even the most pessimistic fan happy in 2012. One of the biggest stats that has fallen between the cracks is the record the Redskins had in games Pierre Garcon started in the regular season. The Redskins were in fact 9-1 in those games as Garcon missed six games this year due to injury. Garcon is still contemplating surgery on his injured toe this off-season, he would like to avoid the procedure altogether if possible. Pierre finished the year with 44 catches for 633 yards and four touchdowns, in only ten games. Many who questioned the pickup of Garcon in the off-season quickly changed their minds once they saw the way Pierre made plays after the catch this year. Since Chip Lohmiller left Washington many years ago, the Redskins have had issues at placekicker ever since. The truth is, no kicker the Redskins have employed has been able to stay consistent or come through in clutch situations. After Billy Cundiff started the 2012 year off missing five of his first 12 kicks, the Redskins decided to sign another kicker. The result of the kicker search turned up Kai Forbath who had never attempted a kick in the NFL and had spent the 2011 season on the non-injured, non-playing list for the Dallas Cowboys. Forbath responded by kicking a 50 yarder on his first attempt. Kai went on to successfully kick his first 17 in a row (an NFL record) before missing his first kick in the season finale against Dallas. Forbath also was good on 33 extra point attempts this season and scored 84 points in only 11 games. 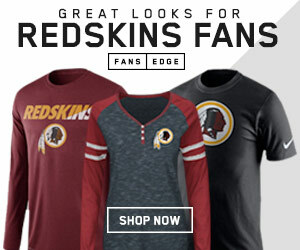 Check out this highlight video (below) that was created by us here at HTTR4LIFE.COM that commemorates the 2012 Washington Redskins season.